Hey Adam... have you ever seen the album for this issue? I have a bunch of Mexican baseball cards and I am trying to get information on and have never seen the album. In bronze. Measures about 5" x 8" [12.5 cm x 20 cm]. It says "Made In Paris 1909 Fraisse"
Édouard Fraisse is known mainly for his compositions inspired by sport. He was a member of the Société des Artistes Français and the Société Nationale des Beaux-Arts; he also exhibited at the Salon d'Automne. Fraisse studied under Barrias, Coutan, Chalpain and Vernon. He collaborated with Henry Demey on numerous medals and plaquettes that typically depicted figures and especially sports figures in action. They were considered to be some of the best and most prestigious plaque and medal makers in France during the 1920s and 30s. He was made a Chevalier of the Légion d'Honneur in 1929. I wondered why Willie Lewis. Turns out that he moved to Paris in 1909 and fought there several times over the next few years. In early 1910, Lewis made an unsuccessful bid at the world middleweight title losing to Billy Papke and made two unsuccessful attempts at the world welterweight title, controversially drawing against World welterweight Champion Harry Lewis (no relation) twice in Paris. Last edited by Exhibitman; 03-30-2019 at 01:45 PM. Such a cool piece, Adam. I am kind of surprised the artist did not go with Sam McVey. BoxRec shows him fighting over a dozen times in France in 1908 and 1909, usually in Paris itself. McVey was the "idol of Paris." That nickname is even on his gravestone. Flawless BST transactions with Arazi4442, wrestlingcardking and Justus. Last edited by Bored5000; 03-31-2019 at 10:12 PM. Oh wait. In bronze, wow! I thought it was plastic made to look bronze. That's really unusual Adam. Fraisse did a sculpture called the boxer which I think looks a heck of a lot like Mcvey. Ah, ok. I wasn't aware of that. 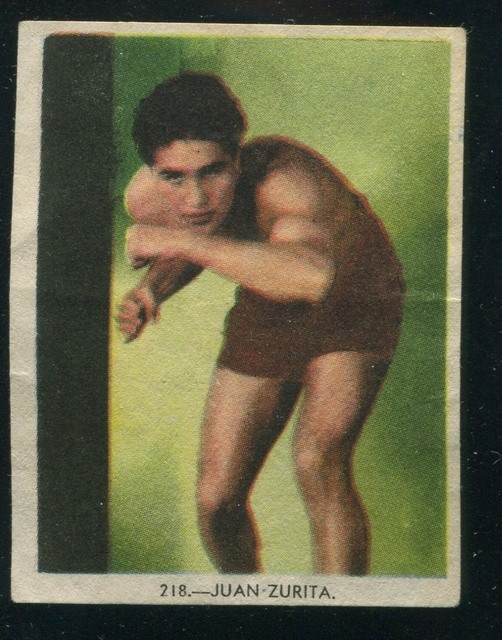 Every once in a while I get the urge to pick up another vintage boxing card. Once I saw these C. 1908 Birmingham Smallwares Jack Johnson postcards, I had to have them! Images are incredible. Just arrived today. Anyone have more info on these? I'm assuming these are some of the earliest Jack Johnson cards/ collectibles? I have a 1909 Ogdens "RC" already. Also picked up my first period John Sullivan piece (CDV) and the 1909 Jeffries/Johnson/McVey playing card, another Rookie era piece. These smallwares are now my favorite boxing pieces now of my relatively small boxing collection. The one of Jack Johnson in the suit and top hat may be my favorite of the bunch! Any idea if PSA grades/slabs these? I don't think they have yet but not sure if they will? I think I'll probably have slabbed by SGC at some point, they all have some glue residue on the backs anyway except the one already graded 2.5. Erick, those Birminghams are amazing in quality and subject! They are all new to me. Thanks for sharing. Even that Johnson/McVey card, which isn't that rare, but is probably my favorite boxing card of all time. The set is likely a 1908-1909 mix since it has a post-fight image and the fight was 12/26/08. I doubt they'd have sold the card for only a week. I don't know if PSA would grade them but I think SGC would. We (all) really need to try and get PSA grading more boxing stuff. If I wasn't so busy at work and trying to get the next edition of my book done before the National, I would try to press them to up their game, for purely selfish reasons: I have a ton of cards of HOFers that they would need to grade so I could register a HOF set. There are lots of HOFers w/o cards that PSA grades. Last edited by Exhibitman; 04-16-2019 at 08:12 AM. Great info! Do you have an image of the post fight one? Any idea of total number of cards in the set? Can't seem to find much info on them. I'm thrilled to say I just met a local collector/ dealer today and did a deal for 2 more of these that I did not yet have! Noticed another interesting thing. They are slightly different sizes, neither trimmed. The smaller one is on slightly darker/creamier card-stock and has a different PC back (KODAK AUSTRAL Stamp box). That's the #9 "Ready for a left hook". The smaller one also has a slightly smaller, more compact photo area inside the white border. This Kodak #9 is also the same image as image as the #11 I had with different caption. The #5 "Ready to deliver left uppercut" I got is like the rest I already have on brighter card stock and the same size as others. I'm assuming that likely all cards from the set were presumably issued with both PC backs. Seems like the KODAK ones originate from Australia, in promotion of the fight, while others from UK I believe? Ever seen any other PC backs?